Information technology (IT) advances are transforming the way we innovate in business, thereby disrupting the old guard and their predictable status-quo. It’s creating global market turbulence. Industries are converging, and new opportunities and threats are emerging, like never before. 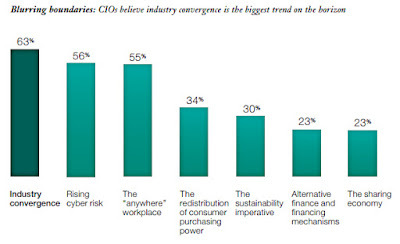 So, how are savvy chief information officers (CIOs) leading this transition? Back in 2015, the IBM Institute for Business Value conducted a market study that included the findings from over 1,800 CIO interviews from around the globe. The resulting insights are worthy of revisiting today, as we consider the digital business transformation outlook in 2017. CIOs realize the barriers between formerly distinct industries are collapsing, as organizations in one sector apply their expertise to others – producing new hybrids and erasing prior traditional industry classifications in the process. They believe it's the most influential trend that's transforming the mainstream business arena. 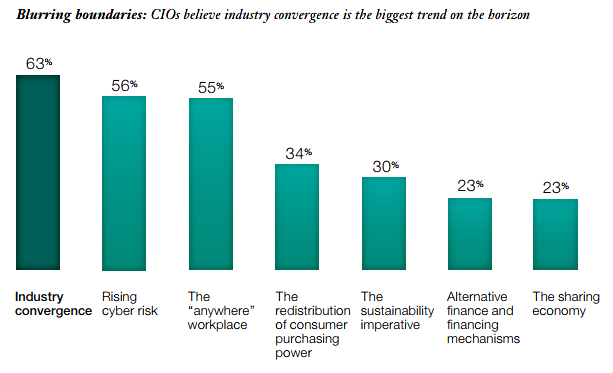 Those deemed to be the ‘Torchbearer’ CIOs are particularly attuned to the shift - in fact, a full 79 percent of these IT leaders expect industry convergence to have a significant impact. How have these CIOs been preparing for a world of converging industries, intensifying competition and hyper-speed innovation? They’re focusing on three key goals in particular: 1) enhancing their organization intelligence and insight, 2) digitizing the front office and 3) strengthening the IT staff skills. hat said, only 57 percent of CIOs are reassessing their strategic direction. Many of the infrastructure decisions the IT department makes are no longer purely about technology -- they’re now considered core components of an organization’s essential business strategy. Most Torchbearer CIOs have a plan of action. Seventy-one percent are considering the strategic implications of new technologies. They know they still have to provide basic IT services, as economically as possible. But they’re also looking for opportunities to create a competitive lead and improve the organization’s bottom line performance. Moreover, the Torchbearer CIOs also place far more emphasis on building an agile organizational culture – one that supports rapid software developer experimentation and IT services prototyping – to help their team reach the market first with innovative new offerings. In addition, the Torchbearer CIOs are eager to form partnerships that exploit the full potential of digital business technologies. They recognize that few enterprises can provide the full array of products, services and experiences that their stakeholders need and want. Focus on disruptive innovation. Build an agile culture where rapid experimentation, informed by reliable intelligence, is the norm. Split big projects into smaller, more manageable chunks, allocate specific tasks to different teams and give them the freedom to get on with the job. Pay close attention to what your external customers say. They can help you identify new trends, pinpoint problems with a product or service, clarify what differentiates your offering and establish what really matters to them, not just what you think they value. Invest in technologies that will help you decipher the data you collect, and ramp up your organization’s analytical power. Identify the sorts of skills you’ll need to perform tomorrow’s jobs, not just the talent you need today. Recruit for the future and collaborate with organizations that possess relevant expertise. Rotate existing employees every few months to help them develop an innovative, entrepreneurial spirit, strong business sense and the ability to communicate complex technological issues clearly. Progressive CIOs have another significant thing in common; they know how to maximize their investment in legacy IT systems, and apply that solid foundation with the adoption of new platforms that - when combined - enable them to achieve superior transformation results. For too many years, the decline of the mainframe platform has been predicted by those who have not been aware of the ongoing enhancements to these highly reliable systems. Many of the uninformed parties thought that mainframe extinction would be accelerated with the growth of cloud computing services. In fact, the mainframe has become a key component of hybrid cloud scenarios. According to a Forrester Research market study, the mainframe is leveraged by 92 of the top 100 banks worldwide, 23 of the top 25 U.S. retailers, all 10 of the world’s largest insurers, and 23 of the world’s 25 largest airlines. Furthermore, successful CIOs have already unleashed the data and business processes that are embedded within their mainframe-based applications. Starting with integrations between systems of engagement (SoE) and systems of record (SoR), they’ve defined innovative products and services that can tap the mainframe resource via APIs. Besides, containers and microservices are coming to the mainframe as more organizations adopt DevOps methodologies. Forrester believes that integrating established apps with smaller new services will advance the mainframe environment towards faster application delivery, even greater scalability, and better overall manageability. They describe this evolved hybrid IT state as the ‘Systems of Innovation’ that so many CIOs apparently crave. In a follow-on editorial, we'll describe this phenomenon in more detail.